TOKYO -- A woman mayor in western Japan protested sumo's male-only rules Friday in a speech she was forced to make outside of the ring unlike her male counterparts, as controversy over the sport's divisive tradition deepened. 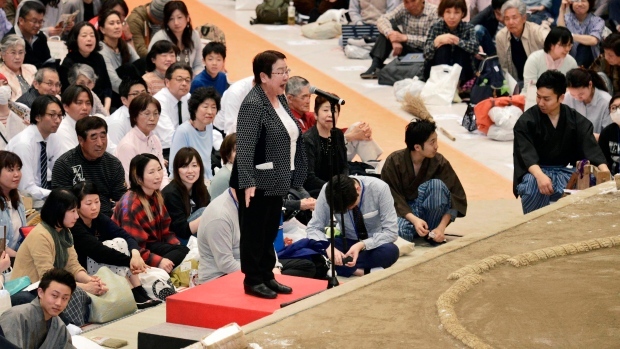 Takarazuka City Mayor Tomoko Nakagawa said that she is frustrated and pained by the sexist tradition in sumo. In the sport, the ring is considered sacred and women are prohibited from entering because they are seen as "unclean." "I am not allowed to go up to the ring and greet to you, just because I am a woman, and I feel mortified," Nakagawa said, as she received applause from the crowd. "It's painful." The Japan Sumo Association's adherence to their rule caused outrage this week, when they ordered women first responders to leave the ring as they attempted to revive an official who collapsed at another event in northern Kyoto. The 67-year-old mayor of the city of Maizuru collapsed during a ring-top speech, and two women, apparently medical experts, rushed in and started performing first aid. When two more women rose to the ring trying to join the effort, announcements demanded the women get out of the ring. The mayor, a man, was then taken to a hospital and survived. Footage and photos on social media have triggered an uproar, with many criticizing sumo officials and saying they were choosing tradition over life. Sumo officials apologized over the incident Wednesday, saying the announcement was inappropriate in the life-threatening situation. Nakagawa said that's not enough. "Tradition is important, but it is also important to have courage and make a change," she said. "I don't care whichever side of the ring we stand, but I do want both men and women to be treated equally." Sumo officials cited their male-only tradition when they rejected Nakagawa's request to speak on the ring. They asked her to respect the tradition. The tradition has sparked controversy for decades, with even top women politicians barred from honouring winners in the ring. In Japan, sumo ring is not the only place that women are discriminated against. Many women still fall behind men in hiring, promotion and pay. Japan also doesn't allow women to become the emperor. Top government officials on Friday asked the sumo association for flexibility. "Nothing is more important than life under any circumstances," said Yoshimasa Hayashi, the Minister of Education, Culture, Sports, Science and Technology, urging the sumo association not to repeat the same mistake. Internal Affairs Minister Seiko Noda, seen as a possible future prime minister, said she had been rejected years ago entering a tunnel construction site due to a similar religious belief. 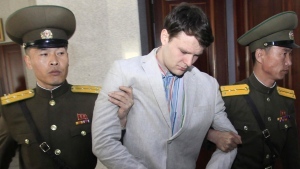 "That is no longer the case (at tunnels), and I expect the sumo association to appropriately respond to the recent incident and decide what steps to make," she said.